Yes, dreamweaver -- You will call into the spell and pray over it exactly what you want. Spells are enactments that we control. They do not control us! Thank you Miss Cat. That was the answer I was hoping for and was kinda expecting. In the past I had a few things go off target and paid for the mistake of acting before thinking. So now I think longer before I act and when I try something new I want be absolutely confident in the outcome. I learned the hard way to do my research. The information on your forum is priceless. Now I just have to get that confusion powder and get that lemon in the ground. So i did the lime break up spell yesterday for my ex and his current shank. I did 4 limes with both there pictures facing away and with break up and all their personal info on his i put his hair that i did on all 4 limes and one hers just her pic and dob, with command. I put in between the 2 pics habanero pepper oil and rotten habaneros, black arts oil, break up powder, sulfer, goofer dush, grave yard dirt, and calamus roots, and licorce along with red pepper flakes and powder, and black pepper i shut it with nails and screws, and then wrapped it with aluminum foil with shinny side in. It was a full moon and i know most would recommend doing this type of work during waning moon but i was feeling the power of the full moon. I was very hot and furious but calm in my intentions i knew how much i wanted them to suffer. I kept speaking in my head how much damage i want done.. When i went to dispose the limes near his work door i buried all four by the entrance door to amplify the spell. Surprisingly i got a text from him right before burying it asking if he can come to get something from by house since we used to live together before i found out he had been cheating and fu**ing some shank-I am not doing any work to get him back. I just want him to be miserable and incomplete and never find peace with any women. Just sharing my work.- i just thought it was strange he texted me when i went to go bury the limes by his work. Weird. but i feel good and i will continue to burn candles on the vinegar i have along side the 2 black curse babies i made for him and the shank. I think you're doing some powerful work here, thanks for sharing. I wouldn't read too much into the fact that he texted; it takes time for spells to reach "full strength," so to speak. I don't think it's a sign that the spell isn't working. Good luck! I got the supplies to do a lemon break up spell, my partner left me for the other woman AGAIN because she did witchcraft on me and him. I know where they live, and I'm thinking about putting the lemon somewhere where they live and where they both pass by everyday (near the door of the appartement) I know one should "step" over the lemon, but that's not gonna fly since she knows about magick. Is that a good option or just useless ? You can bury it where they walk over. Is there a way that you can bury it without them seeing it? Thanks for your reply miss Aida ! They live in an appartement (same building) and there are a lot of plants all around, places I can easly hide the lemons in bushes and flowers, they even live in front of a crossroad, so I was thinking of putting on there also ? I was thinking about doing 4 lemons and placing them all around where they live ? Would you think that could work ? Like in every corner of the exit of their building ? It looks like you posted almost this same exact question almost a year ago in this same thread. Why don't you go to page 2 of this thread and re-read the answers that Miss Aida and Miss Athena gave you back then? "a year ago" I did not know where other woman and my ex lived. I put a lemon under MY doorstep and ONLY my ex would come by and step over it. NOW I know where they BOTH live so I would like to lay a trick there where they both will PASS the lemons. ALSO I asked if 4 lemons would be better all around their building then one. AGAIN NOT UNDER THE DOORSTEP ! Won't fly. should I take a rue or maybe hyssop bath after ? Or something else for protection maybe ? Taking a hyssop bath is advised after performing any kind of negative work, to help cleanse you of sins and wash away the effects of cursing another. It is a general practice to recite Psalm 51 when bathing ("Cleanse me with hyssop, and I will be clean; wash me, and I will be whiter than snow"). Protection generally isn't needed when performing break-up spells unless you fear spiritual retaliation, in which case using Protection spells and amulets would be advised. I read on this forum that someone asked before if break up spell can be buried at the caster's house to affect the target and love rival, the answer was not a good idea -- but what about I have the target walk over it and immediately take it out of my house and bury it somewhere else? it's not possible for me to bury it at their property but a few blocks away. or is it not absolutely NOT a good idea to have him walk over it at all inside my property which could affect the relationship between me and him? same thing with a vinegar jar? It is never a good idea to bury negative work in your home, however temporary. You should find a tree near your target's home that has a hollow in it and "bury" your work there if you can't put it in the ground where he will walk over it. I was wondering if you can offer some advice. I'm looking to buy the break up kit to break up an arranged marriage. They live in different countries. There are outside influences like his family and her family that are making that separation so difficult. Apart from the break up kit, is there anything else that will help or strengthen the power of the spell? Or give him encouragement to leave her? I don't have any details on her. Will that still be effective? 1) I want to try the lemon and lime breakup spell. What are some things I need? Of course teleconference and the lime. 2) I've also seen nails. Any specific nails or can I use nails that you'd use to hang a picture? 3) I also seen something about cayenne pepper with their names. 1) There are dozens of different types of break-up spells that use lemons or limes (also vinegar bottle spells as well) to sour a relationship. What you need will be a souring agent (Lemon or Lime) and some personal concerns or name-papers. You will NOT need a "teleconference." 2) Not all Lemon or Lime break up spells employ nails. Some, for instance, are placed in Ants' nests. Simply follow the directions of the spell you choose to work. If the spell is taught to you with nails as an ingredient, the type of nail may be specified (e.g. rusty, horseshoe, etc.) or it may be left up to you to choose. I personally do not use nails in Lemon break up spells. I have other methods i prefer. To each his or her own! 3) Yes, Red Pepper is a common ingredient in such spells. So are name papers, knives, and /or Goofer Dust. If you read all of the pages here, you will get some good ideas of the possibilities -- however, i saw where you were also asking about freezer spells and vinegar jar spells for the same purpose. If i were you, i would choose one job first, then try the others on different days, in order to keep your focus on one spell at a time. The break up spell kit has everything you need to perform that spell. If you want to give your target extra courage to leave her, then work a white skull candle on him telling him what you want him to think and do. Dress it with Influence and Crucible of Courage oils. If you don't have her details, you can refer to her as "(his name)'s wife". It is a weaker link to her but it could work. And, of course, look at the thread here for ideas. There are many break up spells. I need to do something urgently to prevent my marriage to break. My husband has a business partner and I can see the romantic interest growing between them. As far as I know nothing serious has happened yet. But I Know my husband well, I can see what is going on. Also when we talked he didn't object when I said he is falling in love with her. I would like to prevent that and save my marriage. I am considering two quick spells before I order the Break Up Kit. I understand how to do it. But I want to sour their relationship ONLY, not my husband's life in general. Could the spell effect him negatively if his name and photo are in the lemon together with hers? Also where should I bury it? I don't really feel comfortable to bury it near my house. She doesn't live here, so she will not walk over it. And if I bury it on my property, my husband will walk over it, but also I will. Could it effect our relationship, too? Also it is clear how to do it, but I am wondering if it will work to freeze her out of HIS life if I do the spell? How to specify in this work that I want her to leave HIS life? If this doesn't help, I will definitely do the break up spell, too. Yes, do the lemon and say that his feelings for her will sour. Or their feelings will sour for each other. For a freezer spell, you ONLY use her name, picture, or whatever you have of. Do NOT use his name whatsoever. I will do that then. Just to make sure it is safe can you, please, answer the questions about Lemon Spell in my post? - If I use my husband's photo in the lemon (together with hers) could it 'sour' his life in general or even our relationship? - Should I bury it in my yard even if she is not living in our house? Or it would be better to bury it somewhere else like on the crossroads, etc.? - And if I leave the lemon to rot somewhere in the house, when and how should I dispose it after it is rotten? I just want to make sure I willnot harm my husband. I want ONLY to remove his interest in her. Thank you so much for your reply above. 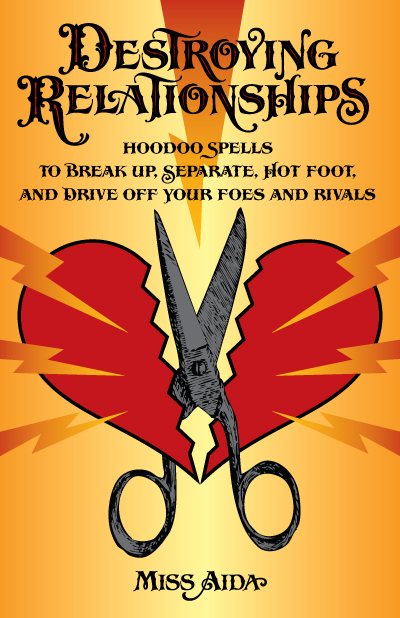 I have ordered Hotfoot Spell Kit at Luckymojo, because I thought that Break Up Spell is for existing relationship and they are not together at the moment. But now I am wondering if Hotfooting works remotely. Can I hotfoot a person who is in another city and is a serious potential threat to my marriage? Will Hotfoot Spell help to drive away a person from my husband's life, not a physical place? Also I would like to know if these spells (like freezer spell and hotfoot spell) drive a person from me, but not from my husband. She is not in direct communication with me anyway. I want her to stop seducing my husband and i want my husband to stop thinking about her. But after freezer spell it seems like started to pull away from me and hide that he is talking to her anyway. When you write the petition paper for that spell, specifically write that this tramp will get away from your husband and stay away. That will help remove her from his life completely. I am currently working a vinegar jar on a girl who made my life hell after my sisters sudden death, she tainted me and slept with my partner (he is now my ex as I dumped him and is with her) she still is outrageously cruel towards me and he owes me a fortune as well as lied about me and called my dead relatives names. Basically I want justified revenge. So I am casting. I am also doing a feces spell to turn her life to poop. I'm flushing her but not him. Now I did a lime spell Saturday and when I placed the petition paper and only the parchment petition paper into the lime it started to sizzle and crackle, it contained NO herbs nothing only the paper. I took this as a great sign that she is arguing with my ex and that her life is souring... would you perceive it the same or am I wishfully thinking? Hi Everyone: I've been a long-time lurker, and have practiced various forms of spellwork and magic for well over 20 years. I recently (yesterday) completed both a breakup and a reconciliation spell* - with the aim of breaking up a relationship that my ex is in IF it is seen as justified, and with reconciling with him in the way that is healthiest (i.e., if that's just as friends, if that's more than friends, even if it means we go our separate ways, I'm happy with that outcome.) While doing the breakup spell, I got an overwhelming sense of love for his current girlfriend, and a sense that he hasn't been fair or faithful to her (both of which are true,) and that I was doing HER a favor by helping to cut the cord. When I did the reconciliation spell, I got a strong sense that he and I can maintain our current friendship (100% platonic only for the past year,) but that he will continue to think of me as the woman he's in love with, regardless of other relationships/platonic status etc. Anyways, the breakup spell included a lemon which I had to let shrivel and dispose of yesterday. This morning, when I was getting ready for work, I grabbed a to-go cup to bring to work, and out fell.... a rotten lemon, leftover from lemon water that I brought to work one day. This *feels* like a sign that the breakup spell is working, but I am curious to hear others' thoughts. *I realize there is a high potential for drama and messiness here, which is why I kept some real boundaries around the breakup AND reconciliation work. We've had a very interesting past year together, and I want to be firm but not over-the-top in any spellwork I do. Thanks in advance for any feedback on what *feels* like a sign. Please do not start new topics on the forum as there is already a thread about lemons as part of Break Up work. I moved your post to the correct thread. Please read through this thread, as it contains lots of useful advice to you. I have a question - when you said you "disposed" of the lemon in your breakup spell, did you deploy it ritually or throw it away? I suspect the latter, because I took the sign of the lemon from your water as an indication that you needed to pay more attention to the shriveled lemon from your spell. If you had just thrown it away in the trash, you were telling Spirit that you were ending the spell and had no further interest in its outcome. The spell became "garbage" to you. If you had indeed properly deployed the original lemon from your spell, take the second lemon as a good sign that Spirit has heard you. Good morning! I disposed of the spell lemon as per the ritual - left it in a hole in a tree, and walked away without looking back. I felt a great sense of calm and closure as I did so. As for the reconciliation spell, I have felt strong platonic feelings and warmth toward my ex - but nothing sexual or relationship-like again. Just strengthening and restoring our friendship. Interestingly, I have received a lot of attention from other men since doing that part of the spell. Thank you again. That's good to hear! Congratulations on properly deploying the lemon. Your work to draw back your ex can indeed hit other people - think of it like shooting a bunch of arrows in the air. You intend to hit him to draw him back to you, but other people can get caught in the crossfire and come to you as well. It just means the energy is out there. Now you forget the spell, sit back and see what happens. I hope it will be a success for you. Thank you! I have already rec'd several signs that the reconciliation work has 'hit,' including unexpectedly walking by the place where we met, last night. I was led in that direction by a friend, and this is in NYC, on a block I almost never pass by. So, I will keep you all posted. I've let go of the outcome and will be patient. Hi everyone, I just wanted to give you another quick update. While I don't know yet how the breakup spell has worked (if at all, and it's only been a week,) I can say that the reconciliation work is starting to take effect. We've resumed casual, friendly communication. Very light, but it's a step in the right direction after a few very difficult transitions and conversations. Thank you again, Miss Athena, for your feedback. My Mother was alive at the time. She warned me not to open it. I didn't listen to her. I took it apart and the bad energy hit me like a brick and I almost fell down. The target went right back to her evil ways. In fact, she was WORSE than before I cast the spell on her. So, the answer to your question is: NO !! Thank you Miss Aida I will leave that thing wrapped up & add another layer to it bc I noticed it leaking a bit thru the foil from the vinegar eating away at it, that's why I was wondering but good thing I asked. I've read over the threads posted here but I want to be very very clear on my work. There is a girl that seems to lurk around the guy I'm talking to. I want to freeze her out so I will do the lemon spell with the pictures but DON'T put it in the freezer because he is in it as well.. Instead just let the lemon sit somewhere to rotten. Correct? And if correct how do I dispose of the lemon once the spell work? Lemon and Lime breakup spells, as well as other types of separation spells are covered in this fine book, "Destroying Relationships" by Miss Aida. I am working on a lemon spell to break up a friendship. One person being bad influence on the other. I was told to use two lemons, parchment paper (with the name of the individuals) then load them with peppers and such. Then i was to bury the lemons in my back yard and pour vinager Over then for 7 days. 1) My question is do I unbury the lemons after the 7 days and dispose of them at a crossroads or should I leave them there and let them rot? I have been trying to contact the person who passed this on, but haven’t been able to get a hold of them. Thought I would give it a shot here. Thank you in advance! Each lemon or lime spell is different -- the way lemon cookies and lemon pies, and lemon soup are different -- but for this spell you would leave the lemons buried. Thank you for the reply. I will leave them put! I’ve been doing a lemon spell to break up my ex and his current girl. I want him back and will work on the reconciliation spell once she’s out of the picture. This is what I did: cut the lemon in half (knife was anointed with break up oil), added pictures of each with name and DOB in the back (as well as name paper names were written on a piece of paper and cut with scissors anointed with break up oil), placed inside the lemon without touching and added chili peppers, break up oil, and vinegar and 9 red ants. Closed the lemon with 9 nails and tied closed with black thread and covered with aluminum paper shiny side facing in. Today is the 8th day with the lemon but I have a couple of questions. 1. I haven’t been able to burn a candle daily. Does it matter or do I need to start over? 2. The lemon started rotting on the 2nd day so I place it in a Tupperware container so the juices wouldn’t leak everywhere. Do I need to add another layer of aluminum paper? 3. When I bury it in the graveyard, does it matter what time of day I do it or what tumbstone I bury it at? Does it have to be buried at a tombstone or any graveyard will work? For example, if I go visit my great grandma’s grave (she doesn’t have have a tombstone just a plaque) can I bury it next to her or doesn’t it have to be a non-relative? 1) You're okay, just burn candles when you can. A lemon or lime spell need not be a candle spell. 2) Rotting is good, in this spell. More aluminum foil is good. Do not bury the Tupperware. 3) Bury it with the spirit of anyone who says that he or she will help. If it is your own relative, so be it -- if not, find any helpful spirit. stillsosola, I tried to find a way to message you, but there wasn't one. I posed this in the vinegar jar spell thread, but it belongs here. How long did it take your sister to break up with the abuser after you did the lemon spell (thank you for that, I am doing it tonight)? Did she leave or did he? If I do a lemon break up spell, What day should i do? As soon as I done the spell, should I bury it in the grave yard? Or Should I keep it until it rotten? You can do the lemon any day. But Tues (Mars; anger and war) and Sat (Saturn; curses of limitation) would be good choices as well. You can dispose of it once done, you can stick it in a jar with vinegar or milk to rot, you can bury it in a graveyard, you can sit on it to rot then dispose. All are traditional. Think about the work you are doing and the method of deployment and what it says about the work. I like the graveyard because it is symbolic to killing the relationship. It is still summer and warm in most of the country and the lemon will still rot, showing the relationship rot away. Should I bury lemon with aluminium foil or with out, in cemetery. I bury mine in it but you can do either. Pay the spirit you are leaving it with, also pay as you leave by dropping coins as you exit asking the spirit of the cemetery to not let any spirits leave with you. Best of luck! Hi, I am little bit nervous now after reading not let any spirits leave with me! I am a scared person to go to a cemetery. But i thought I will take this step because i love him madly. I put the lemon my window sill to get rotten before i bury. Thanks god i didn't go, otherwise i would leave with out dropping coins before i leave cemetery. I will wait a week and take it bury and i follow your advice. Thanks j82 saving me. I first wrote out my petition paper which went like this (with the help of the LM forum)-- "Jane Doe is completely frozen from Damian Jaron Evans life, never to see, touch, make love or speak again, may she be cold as ice, may the relationship be frozen dead"
I added alum, black pepper, poppy seeds, and red pepper to the petition paper and then closed it up with 9 pins. After closing up the lemon with the pins i wrapped it in aluminum foil (shiny side facing the lemon)-- I burned a black candle dressed with Hot Foot Oil and Crossing Oil and let some of the wax drip onto the enclosed lemon. I let the candle burn completely out-- when i first lit it the flame was fairly high, but it continued to get higher from time to time-- it stayed pretty high throughout the duration of the burn. Regarding my previous post above-- if i have to redo my lemon spell how would i get rid of the messed up one and should i make a new one immediately or wait until a Tues. or Sat. and do so during the hours of Mars like I did with the original one? Sounds like you did a good lemon spell for break up, now it sounds like to me you mixed two spells together, unless I am not understanding and you planned to freeze the lemon in the freezer. You used sharp objects to hurt them, you used hotfoot to send her away which is good. But im confused on the purpose of the work, was this a lemon spell to rot or spoil, to sour or was this to freeze them in that state in a freezer. Adding his name to a freezer to be in a constant state of sour with her is ok. It looks like you took the freezer petition and mixed it with a lemon break up. Many ways to write a petition but look at the vinegar jar we discussed earlier under that topic, I gave options on a petition and name paper, you would do them the same way for the lemon. The lemon is the deploying method of the work a container munch like a jar. Here is a general way to work a lemon or lime: cut the lemon or lime away from you. Place the items before you and pray that the couples relationship sour like the lemon and rot away. Take a photo cut in half with names on it , write fight break up, hate all over it. I would 5 point spot each photo with break up oil and let dry a bit . Now add one photo on one side of the cut lemon and the other photo on the opposite side ( break up), add red pepper to fight, poppy for confusion cant communicate, alum to silence to not talk, verbane to break up, cat and dog hair to fight like a cat and dog..etc..I also like to add a coffin nail in the center to represent the death of this relationship. Now pull the lemon closed and take 9 pins and pin it shut, dip them in break up oil prior to sealing the lemon then seal it shut. Pray over it as a whole for the break up and ending of them. Wrap it as you stated shiny side in to reflect inward. Let it rot in the sun, bury it in a graveyard, you can freeze it to keep them stuck in that state but it dont sound like its the goal of this work, you can toss in a river to send them away but that also does not sound like the purpose of your work. Now like other spells you can continue to support the work by burning black candles dressed with the oils to break them up while it rots away or how you choose to use it. Waiting? Depends how bad is the situation? Some work with days of the weeks and planetary hours others do not, some work when needed. I take a blended approach I work with them when I can but in an emergency I act. Think of it like a medical condition, will you wait till a wax moon to have an emergency surgery or act right away? Of course you act. If someone steals from you, will you wait till the moon changes to work against him, of course not. Work when needed and work with the moon and days when you can. Some work you can plan out and do that with, some needs to be on the fly. If you felt you messed up id toss it and start over, throw it into a crossroad. Okay I see what you're saying as far as two spells being mixed-- I'm trying to do more of a break up spell. So if I wear to leave the lemon in the freezer as is, would it be too much if I did another but this time with their photos and other ingredients that you mentioned and bury the 2nd lemon in a graveyard? And just write a petition that basically states them breaking up and the relationship dying hence the graveyard burial..